Iranian Quds Force commander Qassem Soleimani (C) attends Iranian supreme leader Ayatollah Ali Khamenei's (not seen) meeting with the Islamic Revolution Guards Corps (IRGC) in Tehran, Iran on Sept. 18, 2016. Qasem Soleimani is a highly influential Iranian general who played a key role in persuading the Kremlin to launch its military operation in Syria one year ago. But who exactly is Soleimani and how far does his international influence spread? After Russian aircraft were deployed in Syria on a permanent basis in 2015 and began to deliver strikes on local terrorist groups, Reuters reported that one of the major "architects" of this operation was Iran’s General Qasem Soleimani, head of the Iranian Revolutionary Guards' special unit Quds Force. According to the news agency, it was Soleimani who described a scenario of military action in Syria to the military leadership in Moscow and outlined the possibilities of influencing the situation. During his first supposed visit to the Russian capital (July 24-26, 2015), Soleimani is alleged to have met with President Vladimir Putin and Defense Minister Sergei Shoigu. "Soleimani put the map of Syria on the table. The Russians were very alarmed, and felt matters were in steep decline and that there were real dangers to the regime," said the report. "The Iranians assured them there is still the possibility to reclaim the initiative. 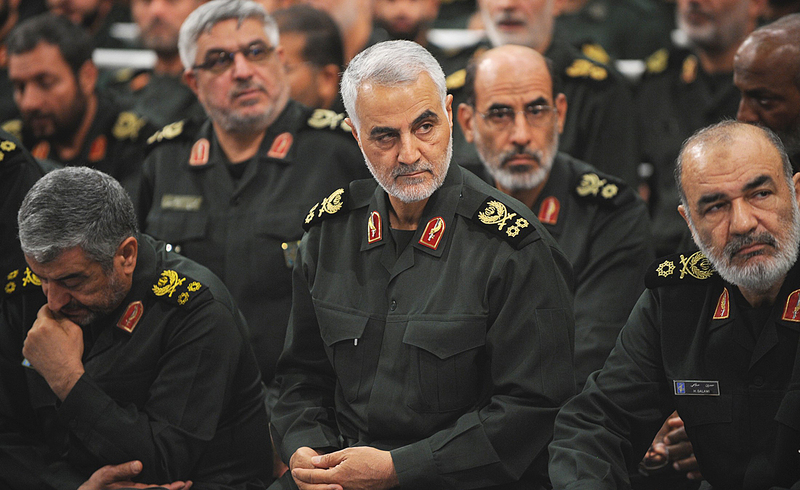 At that time, Soleimani played a role in assuring them that we haven't lost all the cards." In total, Soleimani is said to have made four trips to Moscow – in late July, early August, in December 2015, and in mid-April 2016. A Gazeta.ru source confirmed that Soleimani has been to the Russian capital on several occasions, including in the winter of 2015-2016. "Qasem is trusted, arms supplies are discussed with him," said the source. Soleimani discussed the Syrian operation with his Russian colleagues as early as 2013, but the destabilization of the situation in Ukraine slowed down these consultations for two years. In response to questions from journalists, Russian presidential press secretary Dmitry Peskov has denied that Putin has had any meetings with Soleimani, claiming he had no information about whether the general had visited Moscow. The name of Qasem Soleimani is included in the United Nations' blacklist of 15 Iranian military and political figures who are prohibited from leaving the country because of their connection with the development of a military nuclear program. Soleimani and the Quds Force are also the subject of unilateral U.S. sanctions, which classifies the Quds Force as an organization that provides assistance to terrorism, and Soleimani personally as a terrorist. The general is known as an organizer of sabotage and intelligence operations who has created a wide network of agents with the support of Shiite communities across the region. "Soleimani is the single most powerful operative in the Middle East today and no one’s ever heard of him," John Maguire, a former C.I.A. officer in Iraq, told the New Yorker magazine in 2013. Qasem Soleimani climbed the social ladder thanks to the Islamic Revolution of 1979 that toppled the Shah's regime in Iran. Born into a poor peasant family in the small mountain village of Rabor in the eastern province of Kerman, he left school after five years and until the revolution was an unqualified worker. The young Soleimani strongly supported the ideas of the revolution. In its first days, he joined the Islamic Revolutionary Guard Corps (IRGC), which was subsequently turned into an elite unit, reporting personally to Iran's supreme leader, Ayatollah Ali Khamenei. The IRGC played a key role in the Iran-Iraq war of 1980-1988, and Soleimani in one way or another participated in the preparation of the unit's operations. It was then that he laid the foundations for his future network of agents, establishing contact with the leaders of the Iraqi Kurds and the Shiite Badr Organization, which fought against Iraq’s then president Saddam Hussein. Soleimani became the head of the Quds Force in 1998. The unit coordinates and directs the activities of the network of Shiite "revolutionaries" opposed to U.S. allies in the region, including Saudi Arabia and Bahrain. The unit played an important role in the overthrow of dictator Saddam Hussein's regime in Iraq. Soleimani personally commanded Iraqi fighters and established a relationship with the majority of parties and organizations – at that time, he was considered to be the real master of the situation in Iraq. After the fall of the Hussein regime, Soleimani already had influence over major political figures in Iraq. Over time, a network of alliances throughout the region has formed under the leadership of the Iranian general. When Iraqi cities, one after another, began to fall into the hands of Islamic State, Soleimani's network immediately responded. For Iran, the fight against ISIS became a priority: The terrorists were actively destroying Shiite sacred sites. Soleimani took command in his hands and moved his best fighters to Baghdad. The Quds Force played a vital role in the main victories by the Iraqi armed forces in Tikrit, Fallujah and Mosul. When the terrorist "Caliphate" moved into Syria, the Quds Force was ready. According to Debka, an Israeli resource with strong ties to the country's security services, Iranian specialists are overseeing the military operations of Assad's army on many fronts, as well as coordinating the activities of Lebanon’s Hezbollah group, their allies and part of the Syrian opposition in the fight against ISIS. Iran officially denies the presence of IRGC fighters in Syria. Naame Sham, an Arab-Iranian online resource with links to the Syrian opposition, quoted Assad himself, who reportedly stated at a meeting: "Major General Soleimani has a place in my heart. If he had had to run against me, he would have won the election. This is how much Syrian people love him." A soldier to the end? With such authority, Soleimani could easily start a power struggle in Iran. With a presidential election due in 2017, there have already been calls on Iranian social networks for Soleimani to put forward his candidacy. However, in September Soleimani made a statement that he had no political ambitions and wanted to remain a soldier till the end of his days. It is clear that for now his plan is to bring the Syrian campaign to a successful conclusion. And if that happens, Soleimani won’t need any elections in Iran. Read more: Was the Syria deal doomed from the start?